We now support whisper message on all numbers and plans. Whisper messages let you know which Vumber was called before you speak to the caller, allowing you to greet your caller appropriately. A whisper message is a short message that plays to the person answering the call just before the call is connected. Your caller cannot hear the whisper. You can allocate a different whisper message to each Vumber number you have. 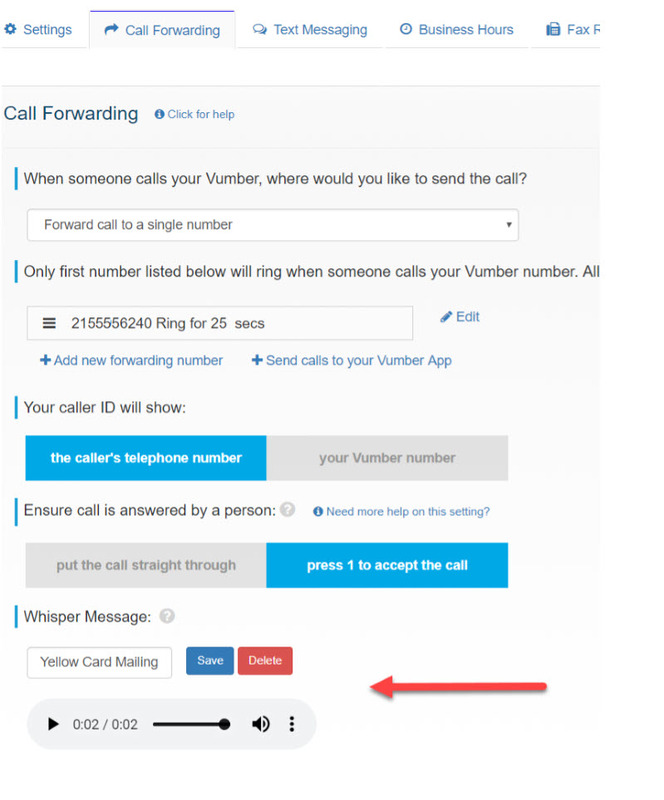 So for example, if you have a Vumber for your recent "yellow card" campaign, you might create a message that speaks out "Call from yellow card mailing"
Why use a Whisper Message? Answer calls with the most appropriate greeting, helping you sound more professional. Save valuable time when talking to your Caller by knowing why they are called even before the call connects. Better manage your time by allowing you to screen calls. How do a use Whisper Messages? As always please reach out to support@vumber.com for further details or specific questions.